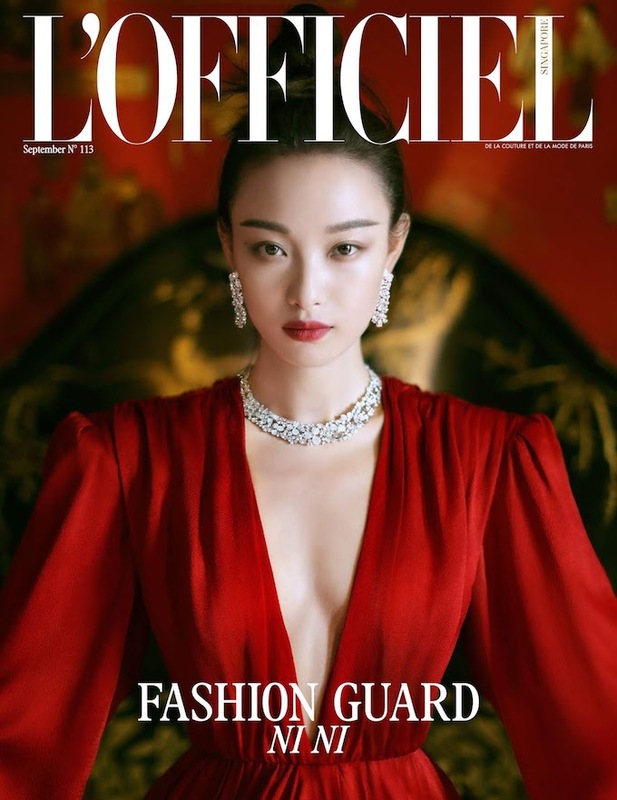 L’Officiel is declaring that Ni Ni is ready to take over the world as she covers four editions of the magazine around the world this month including L’Officiel USA, Singapore, France, and China. The beautiful editorial captured by Chen Man which transitions from bold to sparkling to dramatic finds gorgeous Ni Ni exhibiting her trademark exuberant energy as she models Gucci fashions and Tiffany & Co. jewelry. The talented Chinese actress has been poised for success ever since a breakout role in The Flowers of War in in 2011 where she held her own opposite Christian Bale. I watched that film and her screen presence was compelling. Her next project is Yuen Woo-Ping's The Thousand Faces of Dunjia and she is currently appearing in The Rise of Phoenixes which is streaming on Netflix now with English subs. It also stars Chen Kun who is one of my favorite actors so of course I had to give it a watch. I'm two episodes in and its starting off a little slow but there is already quite a bit of intrigue. The set design is stellar and it makes you feel as if the history of imperial China is unfolding right before your eyes. I had my doubts about Ni Ni playing a cross dressing male because she is so pretty but she is quite convincing and the chemistry was crackling when she first meets the crown Prince and mistakes him for a tailor. This show is quite an epic at 70 episodes but baseball season will be ending soon. Great photos! thanks for the information. She looks absolutely beautiful great cover, Have an awesome weekend. She looks absolutely stunning in all her photos! Red and gold look amazing on her! Love that red dress! Have a great weekend Rowena! Ni Ni is gorgeous. Beautiful editorials, all of them. That red gown is stunning...and I also love the black and white photographs, they are so classic. She looks so beautiful yet so different in all the pictures. These pictures are absolutely beautiful, thank you for sharing! What a beautiful editorial and of course she photographs beautifully. Now I'm definitely curious about her as an actress!